Warring factions in the protracted Bawku conflict are said to be recruiting child fighters to fortify their positions. The children are being used by their parents and warmongers to attack perceived opponents either to kill or maim them. These children were said to have been found trying to stone a woman to death but the woman was saved by security agents. On another occasion, some children were alleged to have been found with an adult who was trying to give them some petrol to ostensibly torch the homes of their opponents. These revelations were made by Commanding Officer of the Airborne Force Detachment of the Ghana Armed Forces, Lt. Col. Isaac Awuah- Mantey, while he was briefing Vice President John Mahama who was on an official visit to Bawku in the Upper West region to evaluate the situation on the ground and find a lasting solution to the conflict in the area. The Vice President was last week directed by President John Evans Atta Mills to visit Bawku and try to resolve the impasse between the warring factions. The Vice President was accompanied by Cletus Avorka, Minister of the Interior; Mahama Ayariga, Presidential Spokesperson, both of whom are incidentally from the area; Mark Woyongo, Upper East Regional Minister; and Baffoe Bonney, Special Advisor to the Vice President. The rest were Deputy Commissioner of Police Patrick Timbillah, Director of Police Operations at the Police Headquarters; Brigadier-General Joseph Adinkra, Commander of the Northern Command; and Assistant Commissioner of Police (ACP) Alhaji Hamidu, Upper East Regional Police Commander. The delegation met with the two factions in the conflict in an effort to resolve the impasse. Renewed violence erupted in the Bawku area on Sunday March I, during a festival where sporadic gunshots rang through the night, resulting in the death of nine people as confirmed by the military. According to Lt. Col. Awuah-Mantey, another dimension to the conflict was the attack on women and children, many of whom had been killed. He mentioned the rivalry between supporters of the two most prominent parties in Ghana, the National Democratic Congress (NDC) and the New Patriotic Party (NPP) as one of the causes of the conflict. Lt. Col. Awuah-Mantey alleged that it was perceived that the Kusasis were NDC sympathizers while the Mamprusis sympathized with the NPP. The Commander noted that at the height of the conflict, some people were arrested with sophisticated weapons including four AK 47 rifles, 03 machine guns and one single- ' barrelled gun. He said about nine people had been killed so far with many people injured and houses burnt, while the security agents had arrested about 41 people for questioning. 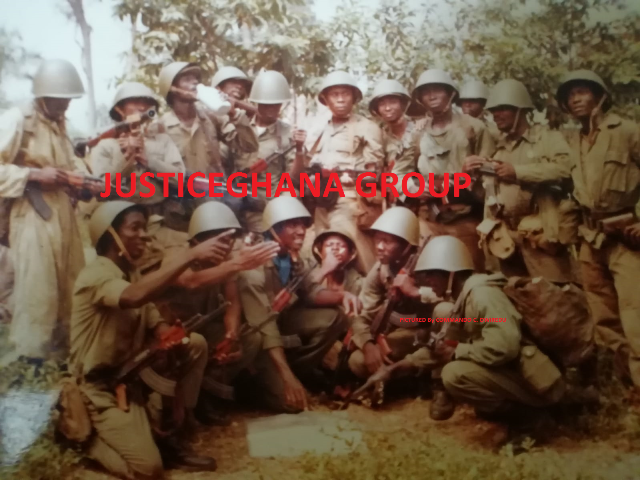 Lt. Col. Awuah-Mantey was however not happy with the way the arrested persons were set free• or given bail by the courts. He told the Vice President that after risking their lives to arrest some of the suspects, the courts easily gave them bail and these miscreants found their way back to town, walking on the streets of Bawku with their heads held high. This development, according to him, was demoralising to the men and officers on the ground and also compounded the lawlessness in the area. He suggested to the Vice President to seriously look at the manner in which such persons were released by the courts. Lt. Col. Awuah-Mantey also informed the entourage that many of the young people lacked basic education and were therefore susceptible to corruption and prone to crime. Suggesting solutions, the Commanding Officer said the leadership of the feuding parties should be made to smoke the peace pipe and compelled to sign an undertaking not to foment trouble. He appealed to Mr. Mahama to help the security agents with some logistics such as toilet facilities since those available were not enough for the over 450 men on the ground. ACP Alhaji Hamidu for his part noted that 'some of the vehicles, especially the armoured cars, had broken down. In his reaction, Vice President Mahama commended the security agents for their sacrifices to the cause of the nation and promised to immediately tackle their logistical problems. He was not pleased with the situation on the ground, particularly when the new administration had barely settled down and needed human resources for the total development of the nation. Mr. Mahama reminded the security personnel of the existence of the rule of law which did not allow the arbitrary use of powers. He however promised to carry their concerns to the Chief Justice with regard to the situation where suspects always found their way back to the streets. He warned trouble makers in the area to give peace a chance or risk being jailed. He also cautioned troublemakers who hid behind political parties to foment trouble, saying no party would allow any of their members to commit crime in the name of politics. The Vice President later addressed the personnel of the security services and encouraged them not to give up on the cause of peace.